Long overlooked for its more renowned neighbor of Bali, Lombok is slowly emerging as an enticing destination for those looking for untouched natural wonders surrounded by pristine seas and lovely, friendly locals. The island’s most distinguishing feature is Mt. Rinjani, Indonesia’s second largest volcano. From this central height, the island spreads out in rocky terrain into lush forests with hot springs and rushing waters, followed by abundant plantations and paddies down to its spectacular beaches. And no trip to Lombok would be complete without a relaxing stop at one of the Gili Islands. There is a lot to discover in these tiny islands, from the white sand beaches to the marine life frolicking among its coral reefs. You just might want to stay longer and enjoy this secluded paradise some more on your own! All these spectacular wonders are a joy to the senses while exploring by bike. All the while, the local Sasak people will be on hand with smiles and welcomes for visits to their villages and places of worship. Lombok is home to a 16th century mosque and a traditional belief system embracing aspects of Islam and Hinduism, while still believing that their ancestors watch over them from the heights of Mt. Rinjani’s volcanic interior. Pick up from the airport and transfer to our hotel in Senggigi. We assemble at our welcome dinner and go over a trip briefing. We head to northwest along seaside curvy roads uphill and downhill. Make a visit at Bayan Village, highlighted as the indigenous group of people with combined religions and animistic belief living there and a center of Wetu Telu. We overnight in Senaru. It's the longest ride with unseen tourist spots' visit for a stop at the oldest mosque on the island, Bayan Mosque, Obel-Obel beach, known for its astonishing black sandy beach and the giant tree at Sambelia Village before arriving and checking into our hotel in Tetebatu. Today is the easiest day of ride, heading southward for our destination at Kuta beach. We ride on the flat paved and gravel roads with some downhill section and through local villages, lush paddy sight and make a souvenir shopping for the colorful woven fabrics at Sasak village. We cycle on mixture of good tarmac, broken and undulating roads with uphill and downhill, but rewarded by wonderful natural green and blue ocean scenes along the way to our overnight place at Sekotong beach. It's a easy chilling day with a 30-km short ride from hotel to nearby beach for a boat ride to Gili Air, the smallest island without motorized vehicles! The rest of day is on your own after finishing island loop and lunch. We meet up again at our farewell beach BBQ dinner. Goodbye the island and transfer back to Lombok for your onward travel. Day 2 - Senggigi - Karang Bayan - Senaru Ride 85km. +1,127m / -619m. This tour covers around 350 km in 4 full cycling days and 1 half day, and can be quite challenging. One day you will cover over 100 km. Starting from the beach resort of Senggigi, we will take a coastal route for expansive oceans views then up to the base of Mt. Rinjani. After venturing through rice paddies and fishing villages, we will end the trip with an exploration of Gili Air Island, one of three idyllic gems still untouched by motorized vehicles. Suitability: This trip is recommended for riders who enjoy and have some off-road experience, but you don’t have to be an expert to get the best out of this trip. This tour is mainly on jeep trails and single track. While the off-road riding is not that technical, some experience is highly recommended. The support vehicle cannot always follow but will meet the group at certain points along the trail. Biking Conditions: This trip has a few flat sections, and it also includes surfaces such as paved and broken tarmac roads. As far as gradients are concerned, all the trails except one have an overall down-hill element to them (in other words they finish at a lower altitude than the start). A few steep ascents and descents are also part of the program, but these are normally short and sharp. A member of the SpiceRoads team will pick you up from the Lombok Praya International Airport and transfer to our hotel in Senggigi. Once there, you can relax by the pool or if you’re really excited (and we’re sure you will be), you can start assembling your bike and get into the mountain-biking mindset. We'll meet for a trip briefing and then head to a nearby restaurant for dinner. After breakfast at the hotel, you get yourself and your gears ready for our cycling adventure. We start pushing our pedals on the coastal route’s tarmac road, heading northwest through curves and a slight downhill and uphill to Bangsal Harbour, a sea transfer point to the Gili Islands and just before the harbour making a short stop at Malimbu or Nipah hill for the best view of the three Gilis. After breathing in the ocean air, we're back biking, taking a downhill road to reach Pamenang town for lunch at a beach restaurant. We continue our afternoon by traversing on a flat road to Bayan Village, the center of the Wetu Telu, a religion that combines Islam, Hinduism, and older animistic beliefs, where we visit with local villagers. The last part of the trail is a steep road from Bayan to Senaru, where there is a popular gateway to a trekking trail to Mt. Rinjani and where we will stay overnight. Today we will head to the north east of Lombok. Riding long descents for 6 km from the hotel, we make our first stop at Bayan Belek Mosque for a sightseeing tour of the oldest mosque on Lombok, built in the early 16th century. Back on our saddles, we ride up to the northern coast passing Obel-Obel beach where we can observe fishermen at work in their village. This beach is known for its attractive black sands and the quiet ambiance of its untouched natural surroundings. We continue cycling to Sambelia Village to admire the giant trees. Lunch here will be on your own at a local restaurant. In the afternoon, we will keep riding to Tetebatu Village and check in to our hotel here. The goal today is to ride to Lombok’s southern coast. This is the easiest cycling day of the entire trip with a downhill section and then a flat paved way and gravel roads to Kuta beach. We pass through several local communities and can enjoy lush rice paddy scenes before ending at the laid back coastal town of Kuta beach. But, before completing our ride, we will make our a last stop en route at a traditional Sasak Village, the indigenous community of Lombok. Here there are many souvenirs shops, and you may want some of their colorful woven fabrics on display at the village’s entrance. 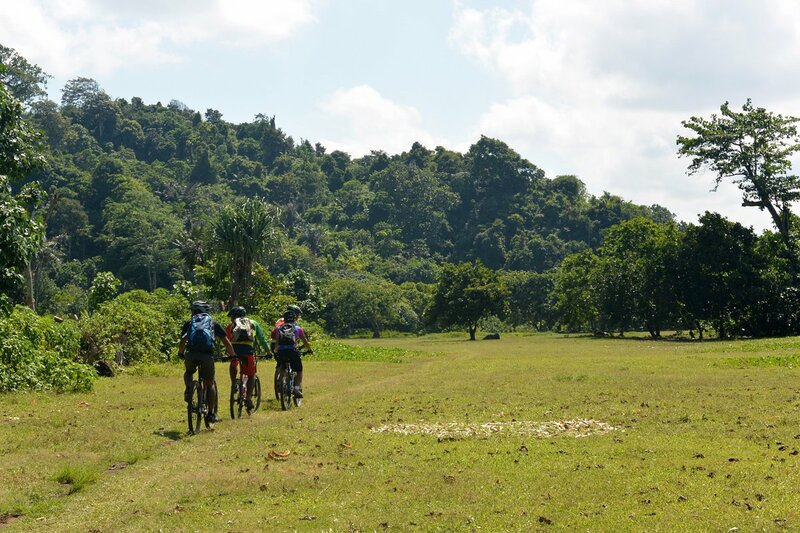 We start off with a challenge for our legs by cycling through the backroads of Sengkol Village. Most of the road is undulating and rugged, with descending and ascending paths for 40 km along both good tarmac and broken paved roads. But the views make up for it with local villages, refreshing green farming fields, coconut palms, and rolling hills, as well as friendly greetings from locals. Before entering Jl. Raja Sapi, it's downhill to the beach with breathtaking scenery overlooking the wide habour ahead. But be careful because this route is short, curvy, and narrow so there may be blind spots – you will need to be ware for oncoming vehicles. We rest some with our packed lunch before pedaling on to Sekotong beach and to check into our hotel. More relaxing today! But we will still bike! We make a short ride on along the seaside road of Sekotong beach to the nearby harbour at Pantai Cemare beach 30 km away to embark by boat to Gili Air Island. On the boat, you will have the opportunity to snorkel the pristine corals reef or just observe them from the glass bottom boat. Once on Gili Air Island, we return to our saddles and ride around this tiny island where we are worry free – there are no motorized vehicles on the island paths. This is the smallest island of the three Gili islands with the total distance around of just 5 km, but it still impresses many holidaymakers with its tranquility, idyllic blue waters, white sand beaches, and friendly locals in its rural island ambiance. But facilities are well-prepared for tourists. After completing the loop and then enjoying our lunch at the beachfront, you have the rest of the day free until we meet up again for dinner on the beach with a bonfire and a sumptuous BBQ. After breakfast, take your time saying goodbye the island before transferring to Lombok for additional nights or to Lombok airport to catch your departing flight. **Please note:** If you choose to extend your stay and go to Bali, a transfer by speedboat to South Bali and drop off at your selected hotel is available upon request. It takes around 2.30 hours from Gili Air to Bali. Please contact us for price and travel advice if you'd like this transfer option. Because some people can't imagine going on a trip without their own beloved bicycle, we do not provide them as part of this tour. However, you can hire bikes locally for the price listed on the front page of this document. The bikes are well-known makes of mountain bikes with lightweight alloy frames, 24- to 27-speed gearing, disc/v-brakes and Shimano components and front suspension. If you bring your own bike, please make sure it is a mountain bike, preferably with front suspension, and that it is in good mechanical order.